What’s the New York New York Hotel Casino? Calling all lovers of the Empire City! 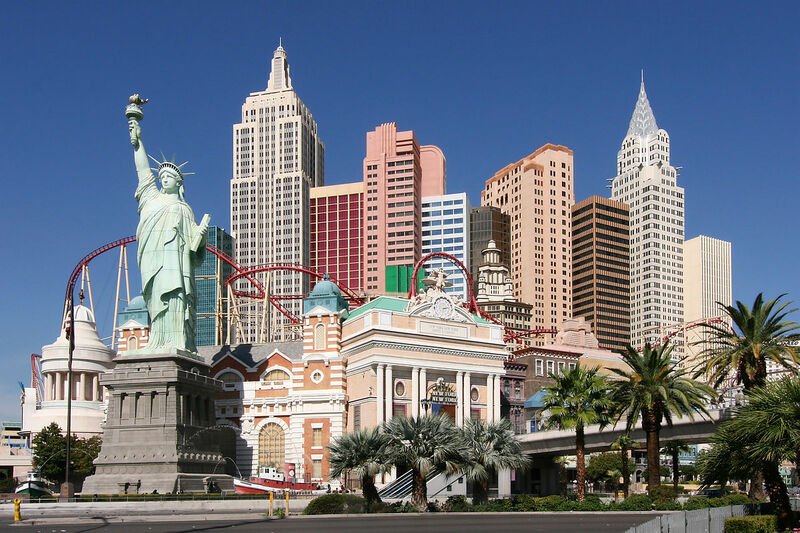 New York-New York, which is located near the southern end of the world-famous Las Vegas Strip, is the perfect place to stay if you enjoy Big Apple dreamin’. Reserving a room puts you right in the heart of all the action at one of Sin City’s busiest four corners. The sprawling resort is best known for its New York City theme. 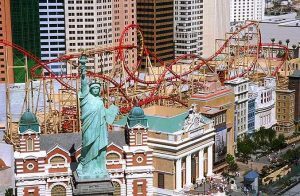 You’ll discover a half-size replica of the Statue of Liberty welcoming you to the hotel and can even enter via a 300-foot-long re-creation of the Brooklyn Bridge. Crave the ethnic flavor of Chinatown and Little Italy? Yearn for the energy of Times Square? Fancy the amusement of Coney Island? They’re all right here as well. Casino Yes, 84,000 square feet. Casino games include Blackjack, Craps, Roulette, Mini Baccarat, Pai Gow Poker, Caribbean Stud Poker, Let It Ride, Big Six, Casino War and Keno. More than 2,000 slot machines including Wheel of Fortune, Monopoly, Megabucks, Jeopardy, Slotopoly, Blazing 7′s Dollars, Empire Slots, Elvis and Moneytime. Race & Sports Book Yes, a 40-seat race and sports book, equipped with 45 televisions and 24 big screens. Restaurants New York-New York has the following dining options: America, Broadway Burger Bar, Chin Chin Café, Nathan’s Famous Hot Dogs, Gallagher’s Steakhouse, Gonzalez y Gonzalez, Il Fornaio, New York Pizzeria, Nine Fine Irishmen, The Sporting House Bar & Grill and the Village Eateries, which offers a variety of smaller food venues. Entertainment Entertainment includes the revealing Cirque du Soleil show Zumanity. You’ll also find the Dueling Pianos at the Bar at Times Square and live entertainment in the lounges. Nightlife There’s Coyote Ugly, the bar at Nine Fine Irishmen and the Bar at Times Square. Attractions Yes, The Roller Coaster at New York-New York. Hershey’s Chocolate World will open in winter 2013/2014. Pool Yes, one pool, with capacity for 840 people, and three Jacuzzis. Health Club or Fitness Equipment Yes. Spa Yes, The Spa offers multiple types of massages and services. The spa also has a full-service salon. Shops It’Sugar, Cashman’s Photo Magic, Regis Signature Salon, Houdini’s Magic Shop, I Love NY-NY Signature Shop, Manhattan Express Photo, Stadium Snacks, The NewsStand, Vegas Express, Las Vegas Harley-Davidson, Grand Central Bling Company; and the Soho Village, which provides an array of New York-themed fashions and gifts. Convention Rooms Yes, more than 21,000 square feet of meeting and banquet space. In-Room Internet Access Yes, it’s included in the daily resort fee. Hotel Amenities Coney Island-style area with games and video arcade, concierge, currency exchange, laundry, luggage and maid service, room service, wake-up call, safety deposit box. Parking Garage Yes, a nine-story parking garage. Shuttle Service to the airport Shuttle service to and from the airport available for a fee from an outside company. Shuttle Service to the Strip No. Minimum Age to Reserve a Room 21 years. Policies The maximum total number of guests (adults and children) in a room is four. Incidental Charges Hotel requires a credit card or debit card deposit upon check-in for incidental charges. Resort Fee New York-New York has a $20.00 per room, per night resort fee. Tax may or may not be included. This fee is not included in your reservation and will be collected by the hotel.